Steve Rimmer is a serial social entrepreneur and co-founder and CEO of Tickets for Good. He joined me on my Business Live FM radio programme this morning for a thoroughly interesting discussion. You can listen to the podcast below. 0 – 7:19 introduction and updates including 40 new jobs as online printing company instantprint set to invest £3.25m in new print technology; Supreme Court ruling says Pimlico plumber is worker; forthcoming events for fun and to develop your business; participate in survey for future of Sheffield city centre. 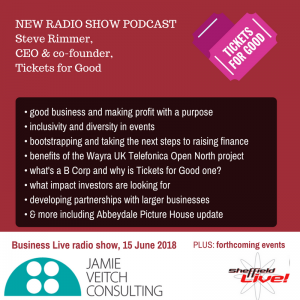 Check out the Tickets for Good platform and The Abbeydale Picture House. More about my Business Live radio show. If you’d like details of new podcasts and enjoy reading useful, practical advice – delivered in an accessible, entertaining format, then you’re welcome to join my free newsletter email list (if you’re not already signed up). Just pop your details in below and look out for a confirmation email to click to confirm you want to join the list.